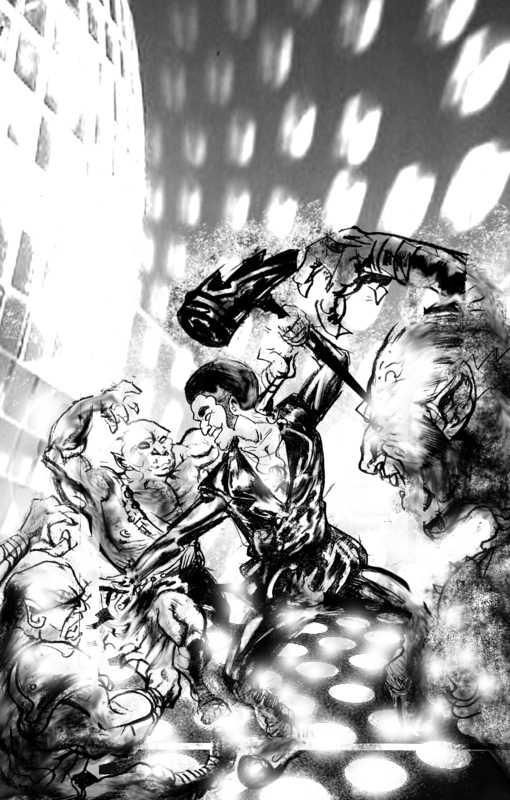 Here is an advance look at the interior art for the upcoming Cobalt City Timeslip anthology. Here you see Midnight Thunder in action from my story, “The War at Home.” Set in 1975, it involves the newly-minted avatar of Thor fighting to protect his neighborhood from Loki and the poisonous influences of the Bifrost Roller Disco. There will be up to 4 more interior pieces, all provided by Timid Pirate Publishing’s very own Jeremy Matthews, our art director. It enlarges just fine for me. I just mouse over it and, when I my cursor turns into a magnifying glass I click on it and the image blows up. It blows up HUGE but it does enlarge. Ok, he didn’t really say that, but he was partial to exploding cars in movies. So I’d like to think that’s what he meant. Good to know the error I was hearing about was localized. Thanks, JZ!